I am 24 years old and I live with a condition called Rett Syndrome. It has given me more gifts than challenges. I am the person I am today because of the challenges I face, but I don’t want you to see me as limited because I have a lot to offer and say – I hope you can hear me! I’m ready to share my thoughts about my life and what I want others to learn about living with Rett Syndrome. 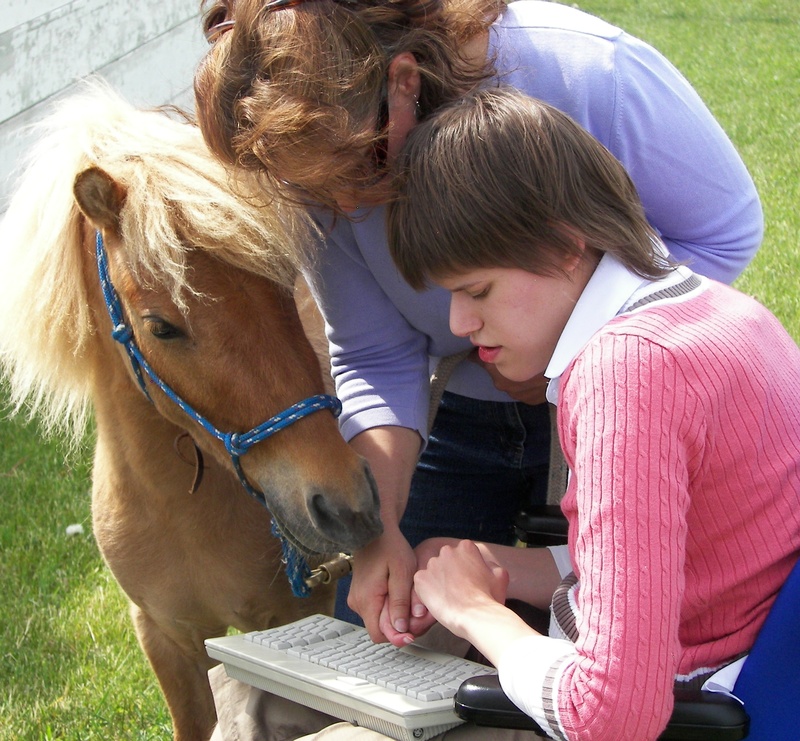 This may surprise you if you have not met someone with Rett Syndrome who is able to type. I am eager to show you that those of us who are silent are not ignorant. I wish to thank my friend Sandy for helping me get this started and encouraging me to share my thoughts with the world. So I will attempt to do that as I am able. Every word on my blogpage is mine exactly as I typed it into my keyboard. Brad and I just checked out your blog. I read it out loud to Brad, he seemed to enjoy the blogs I read to him. I also enjoyed reading them. Both Brad and I enjoyed the pictures too!. Please keep in touch, I am sure Brad would enjoy hearing from you and emailing you too! We will check back often to read the new blogs. Are you the Karly that Kim (RS) and I talked to several years ago? I remember we discussed vision, and the Karly I spoke to said that she also sees the world “in bits” lots of little ones – like a bee. Then we lost contact. Please write back – Kim has completed her school leaving certificate, and is writing her own book, and hopes to start her degree course at uni later this year. I am so happy i found your blog. I live in Sweden an my daughter Rebecka has rett syndrome. She is 15 now. I have always said to others that she understand so much more than they think but not many believe me. You lifted my heart and spirit by telling the world you du NOT funktion in an early infant level! I just wanted to say Hello! I was at the recreation therapy conference and heard your presentation-which I thought was amazing. You are such an inspiration! Take care! It’s Dana.. I was on the phone a little bit ago. I just wanted to say hello and that I love your webpage! Take Care. I am a support worker in Australia. I have been working with a young lady now aged 19 for the past 18 months. She lives in a silent world as you do with Rhett Syndrome. Reading you blog has given me great encouragement to continue to talk with my beautiful girl as I would with my other friends. You have inspired me greatly and I will be passing your information on to many other carers. My daughter, Emily, has RS. She is nearly 5. I am interested as to how you type. Emily has a touch screen computer, but she struggles to make choices on it as she uses her thumb to press, and her whole hand ends up touching the screen – she can’t be precise. She is starting school in September – at our local mainstream school- and I am considering buying Intellikeys so I can create her own keyboard – but I would only be able to put a few letters on it as she essentially uses her whole hand to make her choice. I would be grateful for your advice. I am so glad for Emily that you are her mom. I had an Intellikeys when I was younger. I think it was too limiting for me. I know there are females with rs who are able to be more precise than others. I am not able to type without facilitation because I am not able to hold the keys for the right amount of pressure and time. It was frustrating for me when I was expected to use a keyboard independently. My hand curls up too, but if someone holds my right hand and helps me isolate my pointer finger, i can type very fast. It doesn’t happen with everyone who trys, but for those who are persistent, I am eventually able to express myself freely. If Emily knows you believe in her she will try everything she can to can to communicate with you. I am so very excited to finally have hope for my neice Mary Claire, who has Rett, to be able to communicate with us! We know that she is intelligent, just held hostage by her body. You have opened up new possiblities for her and our family! Because I am a believer in Christ, I firmly believe that every person is created and given life for a purpose. You are fulfilling part of your purpose by giving a voice to those who are yet voiceless and hope to those who love them. I will be reading you blog– ongoing. Thank you for your encouragement and for caring so deeply about others. Your courage and spirit are contagious! I met you at church a couple weeks ago. I am the guy working with your mom on WHC Disability Ministry. I just found your blog (finally) and subscribed to it. I really appreciate what you have to say, and I am VERY impressed with your writing ability and music composition. I hope to get to know you better through your writing, and I look forward to hanging out with you more. I have never met someone with Rett Syndrome. I wanted to tell you that I love your stories. I read the first one on KTIS.fm. I plan to read a few more over the next week now that I have your blog. My father has Ataxia which is a disorder that affects his spinal cord. This affects his balance and coordination. My father is very lucky to have the mobility that he does. Most people with his disorder are no longer walking by his age. We are having a surprise 60th birthday party for him next week and he doesn’t know anything about it. I have watched my father struggle through the years with wanting to be “normal” as he calls it. I try to tell him that he is normal as he is an intelligent person and he is very caring and helpful in the ways that he can be. I believe that is what the Lord has put him here to do. He has taught me that the important things in life are your family and friends not the material possesions you may aquire. I am so happy to be able to read your stories and learn about your achievements. You have helped me to understand your perspective. You are a very positive person and that is one quality that many people struggle with. I hope you continue in your wonderful works as you are a very bright and intelligent person yourself. I found your blog through Equiisite, where Beau was featured today. I have two mini horses, Twinkles and Orion, and have found them to be the same wonderful friends as Beau. He is so fortunate to have an owner like you, and I hope he blesses your life for many years to come. I’m Sarah and I have a 21 year old daughter, Alex, who has Rett Syndrome. We found out about Facilitated Communication when Alex was 5 and you will know what difference it made to our lives. I kept saying that I couldn’t believe Alex was the only intelligent girl with Rett’s and I am delighted to hear that you are broadcasting that loud and clear to the world! I’ll try and see if Alex can see some of your blog. She has visual problems and it is very difficult for her to make sense of a busy screen but I think she might be able to see some of the pictures of your beautiful pony and I know she will be really interested in your trip to the Blackhills. Alex longs to travel! Your blog has reached out and touched us here in England – thank you, Karly. I qouted you in my blog so that people I know could learn a little about you. I hope you don’t mind. Thank-you. you are so beautiful Karly! Karly..Kelly (Brooklyn’s mom) has shared your blog with me and I am so excited to hear all about you! I need to “pick your brain” on how to help Brooklyn, my granddaughter learn to read. I take her to preschool five days a week, and stay with her, helping out whenever I can. Brooklyn already knows her colors, shapes, etc. She is learning letters and sounds, but I need your expertise in how I can do it the most effective way. If you can, please e-mail me with some suggestions……..and how you learned the best…..I would LOVE hearing from you! Hi Karly! I am just reading through your blog again, I really like it! Hey, I guess we now have a mutual acquaintance, I recently met Laurie Carlson and we talked about you a little bit. I was interviewing for a job with We Can Ride, but sadly I did not get it. I am feeling good now after my Cancerr surgery last summer, my doc gave me the green light to return to full time work, etc. last month, I am happy about this. I am glad to see that you are still writing so much. I am writing too! I just finished a funny story about my crazy Christmas eve last year. I hope to read it at Art St. Croix in December. I found your blog off of Carlys voice. I’m so glad you are blogging, keep blogging, get your words out there, show the world there is more then meets the eye. I have autism and siezures, I use a lot of sign language to communicate myself, and have mini PECS books, but typing is always my favorite. I think this world and everybody in it, needs to know, verbal communication doesn’t make up how intellegent a person is. Just by reading your blog I can tell how intellegent you are, god bless! Never give up, keep fighting, writing, making music, and live your life to the fullest! I’ll defintely be checking back on your blog! I know a couple people with rhetts, one little girl in particular who also is blind, i’ll going to give her mother your blog, i hope that is okay? either way hope you have a wonderful week! I’m new to your blog but I am so looking forward to reading it and learning from you. You have so much to teach and give to the world. you are such an inspiration for me! I can’t believe how much you have accomplish and I’m so grateful that you have had the courage to share it with others! My cousin has Rett’s Syndrome she is 13 years now and lives in Venezuela. Her mom has so many difficulties taking her around, because in Venezuela don’t have as many facilities as you have living in the States. Even here in Spain I could say that we couldn’t help her much more. I am so happy that I found your blog!! I’m going to sent it to her so she can see it! Thanks!!! I meet you last year. My two daughters ( 7 & 12) and I just happen to be watching the news this evening. I told my daughters I worked with you before. I learned more about you tonight – you are amazing. I’m looking forward to listening to your music with my daughters. Hi Karly – It is so so beautiful to hear your words, I am mum to my very special Meggy who is nine years old and has RS. I know that my Meg is very intelligent, but I too am always trying to convince people of this. As I read about you I am petrified that I am not doing enough to help her communicate. Meg tells me verbally if she wants peanut butter, vegemite, yogurt or lots of things to do with food but dosent say many other words – except sometimes when the house is really quiet like once when I was in bed and I have heard her say “go to bed – go to bed – I hate bed”. My Meg walks very well but has very very llimited use of her hands – Meg speaks mostly with her eyes and her facial expressions. Meg loves cows, music, swimming and horse riding. Reading your page has been truly inspiring and has given me wonderful hope. Please be so proud of yourself for your achievements – Thank you so much. Hi my name is Teliah and I am 9 years old. I have a little sister Codie who is 3 and a half with Rett syndrome too. I think that you are very clever. I hope that my Codie can type like you do so that I know what she wants and when she wants it. My little sis loves the wiggles she is a huge fan codie is going to the big wiggles show live and the other day we went to circus quircus as a hole family me my dad mum ethan and codie . codies favouret colour is purple and my favouret colour is blue .I just read about you in the paragraph of rett body it sounds like u have a good life. ill pass you on to codie and mum. codie likes karly codie just wrote codie in that sentance codie is really wants to type like you do. Thank you (and your mom, Lois) for sharing today about Rett Syndrome in our Community Bible Class. You truly are amazing !!! It’s great to know that God has a purpose & plan for everyone’s life and that He is using you to the fullest to get the word out about Rett Syndrome … what an encouragement you are to others!! We look forward to having you in our class this year, Karly … God bless you & your ministry. It’s been a while since I’ve been by to check out your blog. So glad to see all that you’ve been doing. I especially enjoyed reading your message to the campers on the last night of camp. So amazing! I love the pictures of the fall scenery also. You live in a beautiful part of the country. I just purchased your CD from Amazon.com. I can’t decide which song is my favorite. They are all so different, but each is uniquely beautiful. I can’t wait to play it for my students. Thank you for continuing to share your life and thoughts with everyone. You can’t imagine what a blessing you are to others. God bless you and your family! Hello, Just letting you know that I enjoy your website! I have a grand daughter that has Rett’s. She is 3 years old. If you could write me back and let me know how they taught you your ABC’s? She is attenting PreSchool at this time. Any information about learning , would be helpful. I am going to buy your C.D. for HER CHRISTMAS PRESENT. I am so glad you found my blogpage!! It makes me smile to know that I have helped you and your grandaughter. It makes it worth my effort. I want to let you know I have written a lot about how I have learned to read and communicate. If you open up the page that says “How I Communicate” it will help you understand. Also, if you haven’t read it yet, go to “My Rett Body” page too. It will give you lots of information about how I experience Rett Syndrome. I hope it helps. Please write again. I love your music. Thank you for the gift of spirit you share with the world. I am giving your cd as a Christmas present to a family with another beautiful Rett girl. I lit a candle for you at http://www.gratefulness.org. I am so proud of & blessed by you and your family! We found our recently that my neice Chloe (my brother’s daughter) has Rett’s. We know so very little. The little bit i’ve read on your blog is so encouraging. I am a teacher. My brother & his wife (Chloe’s parents) have been educators. I am very interested in learning more- not only for Chloe and her parents, but also to know how to deal with my students and their families. This is Ann at The Arc Greater Twin Cities. I have enjoyed reading through your Blog and the many posts that you have written over the years. I love the pictures and stories about when you were growing up. I hope that I can meet your horse someday. Hope you are having a great day. Hello Karly!!!! My name is Felicia Garrett. I am from a small town in Kentucky. I sell Uppercase Living just like your cousin-in-law Michelle. I really enjoyed reading your Blog!!! I could not believe your horse was in your house. What a beautiful horse!!! I have a niece who has Williams syndrome and she is a special young lady!!! I have never heard of Rett Syndrome before until I read your blog. Thank You for educating me. I also work at our High school here where i live ad now you have educated me!!!. I will read your blogs often now. You are a very talented writer. Keep up the good work and I look forward to your next fabulous blog!!!! Love your water chair it looks like sooo much fun!!!! Just saw you while listening to an old Greg Boyd sermon. I am here in the Czech Republic ( Prague) It did me good to hear what you worte way back then. My heart praised God for your heart. Your message is sealed in me . The Lord hug you ; ) now and forever………………..His everlasting hugs. Pray for me when you remember. My heart bounced prayer for you today and also my tomorrows. To Karly’s family, we are from a small town in Louisiana our little granddaugther was recently diganosed with Rhett Syndrome. She was 2 May 25. She has been getting all the therapy she can since she was 1 years old. My husband & I just have one son, my daugther-in-law could not have any children. Our little angel is adopted. She truely has been a God sent. She is a very happy little girl. I started reading Karly’s story I could not stop crying, but after realizing what Karly could do, gave me hope for her. Karly truely is an Angel. THANK YOU SO FOR SHARING YOUR STORY, PRAYER ARE WITH YOUR FAMILY. Hi to every body, it’s my first pay a quick visit of this website; this blog carries awesome and in fact fine information for readers.